Under threat - Bilton volunteers pictured in 2017 at one of the picnic tables at Woodfield Millennium Green. A shrinking band of Harrogate volunteers who have worked tirelessly in transforming what was a vandalised dumping-ground into a wonderful Millennium Green say they may be forced to give up the battle. Nearly 20 years since Woodfield Millennium Green and its fruit trees and bee-friendly flowerbeds was first mooted off Albany Road in Bilton, the trustees are reluctantly having to consider handing the Green back to Harrogate Borough Council. Described by many as “Bilton’s jewel in the crown”, the trust’s chairman said there were not enough committed volunteers to run it anymore. John Hart, chairman, said: “Realistically, to keep going we need a committed team of local men and women to manage the green. This does not involve much time or effort. “Although the green is much appreciated by many local people, no volunteers have come forward. Enjoyed by adults and children alike for more than a decade, the green has has had to struggle over the years against the odds despite its popularity. Even though the site has no regular income and relies on grants and support from the public, it has overcome all its previous challenges, whether that’s graffiti or worse, sometimes with the help of soldiers from the Army Foundation College. As recently as last year, vandals set fire to the garden, ruining a picnic table and destroying tables and trees. Under the national Millennium Greens Scheme, the green was originally set aside for community recreation and wildlife in 1999. It fell into disuse and became a rough field used only by dogwalkers until 2011 when the present trustees were appointed. 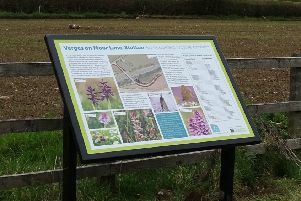 Many improvements have been made over the past seven years in particular, with the help of private donations and grants from Harrogate Borough Council, the county council, Bilton Gala Fund and others. The green is well stocked with fruit trees and currant bushes and produces strawberries, herbs and vegetables in season. There is a also wild biodiversity area as well as plenty of open space for games and tables for picnics. But Angela Clough, secretary to the trustees, said the situation had come to a crunch point.